MORE ON PLAGIARISM: Gad I pity anyone plagiarizing in one of Horace Jeffery Hodges's classes. He has wonderful advice on how to hunt plagiarizers down in his latest post on the subject. (Be sure and follow the links for earlier posts and a reply by Mark Goodacre.) I'll have to link to this stuff again next semester when the essays for my Old Testament 2 course are close to being due. UPDATE (4 December): There's a helpful index of the posts here. And then I remember taking as an undergraduate--out of real curiosity--a course in New Testament Greek and read the entire Greek Testament and got to know it pretty well and got more and more puzzled by something: How can it possibly be that we don't have an Aramaic Gospel of Jesus Christ? All the scholars agree that he spoke Aramaic to his disciples, who would have known no other language, and to the crowds in Galilee, who clustered around him, and they knew no other language. If you believed that this particular personage from Nazareth, whom I refer to in the book as a "more or less historical figure"--if you believed that this was indeed God or the son of God or the anointed Messiah, how can you fail to preserve the actual words, sentences, that he had spoken? How could you not commemorate his discourses literally? Why is there no Aramaic gospel? And what makes me especially suspicious from the start is, as you know, scattered through the gospels are some seven or eight Aramaic phrases, which have been put in more or less, as it were, to spice it up or authenticate it, though it's never explained why they are there. That they did not preserve an Aramaic gospel makes me very suspicious indeed. There's a kind of scamp in there. But he also goes violently crazy as he leads the Israelite host in that ridiculous, mad 40 years wandering through the wilderness, trekking back and forth. He gets crazier and crazier and the poor things get crazier and crazier. One of my favorite passages in the book is what I am talking about--the ridiculous attempt on the part, first, of the neo-Platonising Jews like Philo of Alexandria, and then later the high rabbinical sages to get rid of what they might call the anthropomorphic element and say he isn't a man, he isn't a human, he doesn't do certain things, since it's made very clear that he's walking down the road frequently, that he's picnicking, that he's doing this, that, and the other thing, that he's burying Moses with his own hands, he is closing the door of the Ark with his own hands, and so on. Yahweh is a human, all-too-human, much, much too human God, and very scary. He is irascible, he's difficult, he's unpredictable, and he himself doesn't seem to know what he is doing. UPDATE: But Ed Cook is not impressed with Bloom as a punster. The Jesus-was-married theory says Jews expected men to wed. That's generally true, but modern rediscovery of the Dead Sea Scrolls confirmed that some Jewish holy men in ancient times remained celibate. There's also this issue, raised by Bruce Chilton of Bard College in "Mary Magdalene: A Biography" (Doubleday, $23.95): Judaism's Talmud said a husband cannot move his wife from place to place. Couples usually resided with the wife's parents. Jesus' "constant travel, irregular birth, and unstable economic status made him nobody's ideal husband or son-in-law," Chilton comments. "If Jesus were to have had a sexual partner, Mary remains the best candidate," he thinks. But there's no historical evidence that Jesus did. Chilton chides feminists and New Agers who cite depictions of Mary Magdalene to claim ancient Gnosticism exalted women and is therefore preferable to orthodox Christianity. The earliest Gnostic text, the second-century Gospel of Thomas, says women must make themselves males to enter the kingdom of heaven. That gender elitism contrasts with the basic spiritual equality in biblical Judaism and Christianity. Actually, it's Josephus and Philo who say the Essenes were celibate. The Scrolls never mention celibacy explicitly (odd for a supposedly celibate group), although one passage in the Damascus Document may allude to a celibate sectarian group-within-the-group. Regarding the Talmud reference (typically, the article doesn't actually give the reference), the Talmud was edited many centuries after the time of Jesus and one would have to argue that the traditions in the specific passage were very early on other grounds. But if Chilton is citing the Talmud, I assume he does this. For a different view on the Gospel of Thomas, see here. I have more on Mary Magdalene here. Then there's this from this A.P. article, which belongs in the You Can't Make This Up File: "There's even a "Complete Idiot's Guide" to her, and a forthcoming film version of the 'Magdalene' comic books' woman warrior." Our sages credit the righteous monarch, King Hezekiah, ruler of the Kingdom of Judah for 29 years, with a number of achievements. One of these accomplishments was the hiding of a certain "Book of Remedies" (M. Pesahim 4:10; B. Pesahim 56a). This feat was so lauded by the Talmud that it is offered as one of two possible merits that Hezekiah invoked when he was beseeching God to be healed of his fatal illness, saying: "I have done that which is good in Your eyes" (Isaiah 38:3) - that which is good, namely, the suppression of the Book of Remedies (B. Berakhot 10b). What is this Book of Remedies? Who authored the work? And perhaps most importantly, what is so commendable about its censorship? The commentators have long debated these questions. A SEMINAR ON COPTIC PAPYROLOGY is to be held in Vienna in July. ST. CATHERINE'S MONASTERY IN SINAI and its manuscripts are the subject of an article in Al Ahram by Jill Kamil. Regrettably, it has a disturbing number of errors. Deep in South Sinai, snuggled amidst dry gorges and naked valleys, 17 centuries of uninterrupted asceticism in an orthodox monastic centre trace back to the reign of the Roman Emperor Justinian in the sixth century. Never in its long history has St Catherine's Monastery been conquered, damaged, or destroyed. It is famous for its icons and manuscripts, and it is the latter that is about to receive attention. The Ministry of Culture, in cooperation with the custodians of the monastery, have announced a three-phase project, the first of which includes comprehensive documentation of all the manuscripts -- one of the richest monastic collections in the world and second in importance only to the Vatican. The holy fathers of St Catherine's exercise much secrecy and reserve regarding their heritage, especially their sacred manuscripts. This is largely owing to their unfortunate experience with Konstantin von Tischendorf, a German scholar from the vicinity of Leipzig. He took a precious codex, the oldest translation of the Bible into any language, to old St Petersburg and gave the monks a handwritten note saying that he was taking the work on loan in order to copy it and promising to return it undamaged. The monks counted on the return of the precious codex, but they never saw it again. The great significance of the Codex Syriacus or the Syrian codex, which is now of international fame, is that it is the only known copy of the Greek New Testament in its original uncial script. It was discovered in 1892 and the text is a palimpsest -- which is to say, a text partly erased so that the parchment on which it was written could be used again, as indeed, it was. In this case, the underlying fifth-century text is now so faded as to be virtually invisible. This is very confused. The manuscript described in the first paragraph is the Codex Sinaiticus, not the Codex Syriacus. Tischendorf's role and honesty in handling the manuscript continues to be debated. The second paragraph then refers to the palimpsest Codex Syriacus, which is a different manuscript. As one might guess, it is in Syriac (follow the link and scroll down to "The Old Syriac") and therefore isn't in Greek uncial letters or any other kind of Greek letters. Kamil has conflated the two manuscripts and includes information about both as though they were the same. Its discovery revolutionalised biblical analysis. Before then, von Tischendorf and other scholars believed the Gospel according to Matthew was earlier than Mark's, and that John and Matthew had been direct eye-witnesses to the events in the life of Jesus. Study of the codex led Tischendorf to think otherwise. Through literary detective work, he studied the order of events in the ancient texts, compared biblical stories, and provided evidence -- subsequently hotly disputed but today generally accepted -- that the Gospel of St Mark was written before those of Matthew and Luke. If this is indeed so, then it is somewhat startling to learn that some of the most treasured biblical stories do not appear in it. Were they, perhaps, later additions? Although it is not known exactly where the codex was written, it was certainly not in the monastery where it was found; it had not then been built. Marcan priority was first proposed in the 1830s, whereas Tischendorf (at least according to his version of the story) located Sinaiticus at St. Catherine's Monastery piecemeal between 1844 and 1859. Syriacus was located in 1892 by Agnes Smith Lewis and her sister Margaret Dunlop Gibson. The discovery of Marcan priority had nothing to do with Tischendorf and progress on the Synoptic problem was not based on study of Sinaiticus or Syriacus. See Stephen Carlson's Synoptic Problem FAQ and Two-Source Hypothesis website for specifics on the history of research. Von Tischendorf presented the Syrian codex to then Czar of Russia Alexander II. After Tischendorf's death in 1917, however, the Russian revolution in the same year resulted in financial problems for Russia which caused the precious bible, consisting of 346 folia and a small fragment, to be sold to the British Museum for the then enormous sum of GBP100,000. Little wonder that the monks were subsequently reluctant to let anyone gain access to their library. They have been suspicious of scholars who wish to carry out research in their archives ever since -- even if they hold the highest credentials. This is Codex Sinaiticus again. Tischedorf died in 1874. At least some of the Codex remains in St. Petersburg. Among the greatest treasures is Mt Sinai Arabic Codex 151, which is probably the oldest Arabic translation of the Bible from its original Aramaic -- the language in common use for 1,000 years. It's misleading to say "from its original Aramaic." Only a few chapters of the Bible in Daniel and Ezra (and one verse in Jeremiah) were originally written in Aramaic. I think what she's trying to say is that this Arabic Bible was translated from a Syriac version, as was most literature translated into Arabic. The horde included ancient biblical texts and other documents, as well as Greek texts in uncial script which shed new light on the history of Greek writing. To their delight the monks recognised some dozen leaves of their sacred Syrian Codex; today the 53 leaves originally purloined by von Tischendorf are preserved in Leipzig, 346 leaves and a fragment are in the British Museum, and the dozen newly-discovered leaves remain at St Catherine's. This is Codex Siniaticus again. And, again, some material (I don't know how much) remains in St. Petersburg. The main points of the article -- that St. Catherine's is an incredibly important repository of manuscripts and that the new work on documenting the collections is a good thing -- are correct. But it's a pity that the piece was otherwise so carelessly researched. I thought Jill Kamil was more on top of things than that. I hope next time she deals with New Testament manuscripts and research she'll start by having a look at Mark Goodacre's New Testament Gateway. UPDATE (3 December): Peter Head comments at Evangelical Textual Criticism. UPDATE (3 December): Joe Cathey points to a howler in the article which I missed. THE ORION NEWSLETTER for November 2005 (for the Orion Center for the Study of the Dead Sea Scrolls) is now available online. It may have been there for a while; I just noticed it because a hard copy arrived in the post this afternoon. KEEP AN EYE ON THE NETS WEBSITE, which keeps adding provisional PDF-file versions of their translations of the Greek (LXX) texts of biblical books. Rick Brannan notes the latest additions on ricoblog. JEWISH STUDIES, AN INTERNET JOURNAL has posted a new article: Emmanuel Friedheim, "Timi De-Romi and Tyche De-Romi: A Reexamination of the Historical Significance of a Talmudic Expression" (in Hebrew). You can download it as either a Word or a PDF file. 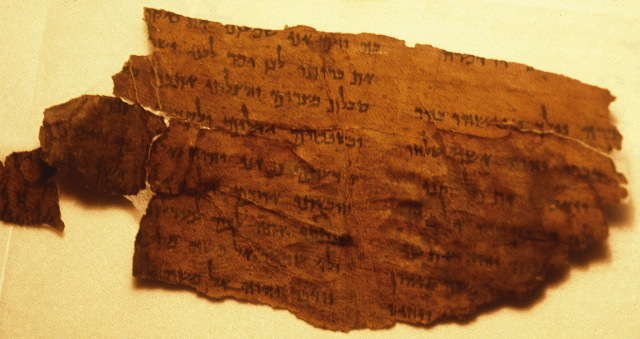 The Talmud Yerushalmi (‘Avodah Zarah 3.3) uses the obscure expression /timi de-Romi/, a term which puzzled scholars until the publication of a Geniza fragment which reads /tyche de-Romi/ instead, i.e., the Greek goddess of Fortune. Indeed, J. N. Epstein and S. Lieberman considered this reading authentic. However, examination of archaeological and historical sources suggests that the /lectio difficilior/ /timi de-Romi/ might also be viable, as demonstrated at length in this article, for in the Nabatean area and among Arabs from the Palmyrene region pagans referred to the goddess /Tyche/ as /time/. THE SHEFFIELD BLOGGING SEMINAR is on Monday, 5 December. I look forward to the blog reports and I hope the papers will also be posted online. (AXcess News) Bloomington, IL - Rather than representing a "new" or "lost" Christianity or some late Gnostic heresy, The Gospel of Thomas is one of the earliest texts from the first Church run by Jesus' family in Jerusalem and pre-dates the literary sources used by the synoptic Gospels, according to a new book by an Illinois Wesleyan University professor. April DeConick, associate professor of religion at Illinois Wesleyan, is the author of "Recovering the Original Gospel of Thomas," published by Continuum. In addition, she says that the text was originally written in Aramaic, which was Jesus' native language, and suggests that the Gospel of Thomas probably came from Syria, which had first been evangelized by the Aramaic-speaking Christians from Jerusalem. "They were very certain that they were living in the very end times," DeConick said. "The ethic of how they were living was end-time living: don't worry about raising a family, don't worry about food and clothes, just get out and convert as many people as possible so that when God's judgment comes as many will be saved as can be. I think that was the mentality that is shown in these original sayings." Once the end of the world did not materialize, those preachers who were performing the "Kernel" began to refocus their apocalyptic expectations. Instead of teaching about a cosmic end, the preachers refocused their message to mystical beliefs and practices. This led to the accretions that have caused the Gospel of Thomas to be misunderstood, DeConick says. UPDATE: Coincidentally, just yesterday I came across the friendly skripture study blog, a group blog whose members (including Crystal, a frequent commenter on the NT Gateway blog) have been systematically commenting on the sayings in the Gospel of Thomas over the last few months. HAPPY FIRST BLOGIVERSARY to Ralph the Sacred River! ELAINE PAGELS is interviewed by Minnesota Women's Press. She talks at length about Mary Magdalene and is suprisingly nice to Dan Brown. The Holy Mountain is an amazing place. The nature is almost untouched by human hands, there are few roads and people usually move from one monastery to another by foot. 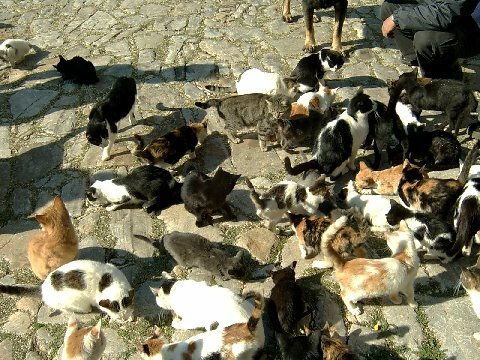 Apart from the monks there are quite a lot of cats (the she-cat is the only female animal allowed to live on the peninsula). IT'S PITCH DARK at 5:00 pm, when I get out of my Hebrew class. This is a dark, cold time of year, my favorite time for reading Victorian detective stories, which generally are dark, cold, and foggy. My son and I have just started reading Sherlock Holmes. But my all-time favorite Victorian detective story is "In the Fog," by Richard Harding Davis. Enjoy! A GRAMMAR OF JEWISH BABYLONIAN ARAMAIC is in the works. This is good news, since it is something that is really needed. I hope there will be an English edition too! Shai Heijmans has the story over at the Hebrew and Aramaic Philology blog. For some currently available resources on Babylonian Aramaic, see here. And, of course, there are the Aramaic incantation bowls too. ANNE RICE'S CHRIST THE LORD is reviewed by New Testament scholar Ben Witherington. JERUSALEM -- Ancient wooden anchors preserved by natural salt for more than 2,000 years have been discovered on the receding shores of the Dead Sea, Israel TV reported Monday. Archaeologist David Mevorach told the TV station that one anchor dated back 2,500 years _ the oldest ever found. Another anchor was 2,000 years old, he said. They were built from acacia wood for Roman ships, he said. The 2,000-year-old anchor has been noted before here. This is the first I've heard of the 2,500-year-old one. Interesting things keep coming out of this site. This article has a nice photograph of the seal. YEAH, my office is like that too. A latter-day Gog and Magog? [Israel Prison Service (IPS) Commissioner Yaakov] Ganot congratulated his [IAA] guests on the scientific achievement, but as their conversation continued, signs of confrontation became apparent − a confrontation that will likely intensify during the coming months. While IAA officials spoke about the tremendous scientific importance of the mosaic floor, the commissioner spoke about the IPS's shortage of space and reminded them that only four of 10 planned cell blocks had been built and that the construction of the others is being delayed, mainly due to the excavations. When Dorfman and Barshad said that the discovery will garner international publicity for Israel, Ganot reminded them that the IPS has already invested tens of millions of shekels in building the Megiddo prison, which plays a central role in the service's expansion plan. At the end of the meeting, it was nonetheless decided that for now, the IPS would continue to cooperate with the IAA, but it was also clear that the two sides are conflicted over the future of the site where the floor was discovered. If other archaeologists do not contradict the initial assessment by the IAA, the floor uncovered at Megiddo by one of the authority's archaeologists, Yotam Tefer, will be categorized as one of the most important findings discovered in Israel in recent decades. Its importance derives not only from the fact that it is part of the oldest church ever discovered here, but also because it dates back to the period in which Christian rituals still were conducted in secret. The main question that occupies everyone, and will continue to do so during the coming months, is what to do with the ancient and important floor: leave it within the walls of the prison, move it for display elsewhere, or leave it in situ and move the prison to another location. This is a thorny question whose answer many parties will seek to influence, but only the government will cast the deciding vote here. A difficult situation. There are many more details about the discovery in the article and it's worth a read. The historian Dr. Yitzhak Reiter, who is now publishing a book entitled "From Jerusalem to Mecca and Back - the Muslim Rallying Around Jerusalem," has been collating for years thousands of publications, religious legal rulings, statements and pronouncements of Muslim clergymen, historians, public figures and statesmen on the subject of Jerusalem. His book draws in great detail a portrait of the great Muslim denial, a denial of the Jewish connection to Jerusalem, the Temple Mount and to the Temple. This argument has strengthened in intensity since the Six-Day War. Several chapters in Reiter's study describe the parallel rise in the sanctity of Al-Aqsa and Al-Quds (the Muslim name of Jerusalem). For instance, the Al-Aqsa Mosque, which according to modern research was built approximately 1,400 years ago, is now being described as a mosque that was built at the time of the world's creation, during the days of Adam, or of Abraham. For example, Abdus-Salam al-Abbadi, a former Jordanian minister of Muslim trusts, has invoked these traditions. So has Sheik Ikrama Sabri, who cited these traditions in a legal ruling he wrote a few years ago, in which he attributed the construction of the Holy Mosque in Mecca and of the Al-Aqsa compound to Adam, and the renewed construction of the Kaaba to Abraham and the renewed construction of Al-Aqsa to Solomon. The Saudi historian Mohammed Hassen Sharab has also written that Al-Aqsa was built by Adam, and another Saudi historian claims that Al-Aqsa Mosque existed even before Jesus and Moses. Another tradition, which is quoted by some present-day Muslim writers, attributes the construction of Al-Aqsa to Abraham. This tradition contends that Abraham built Al-Aqsa 40 years after he built the Kaaba together with his son Ishmael. Reiter reveals hundreds and thousands of legal rulings, publications and sources that demonstrate the extent to which the denial of the Jewish connection to Jerusalem and to the holy places has grown in the Muslim world. Various Islamic sources are now trying to refute the Jewish conception of Jerusalem's centrality in Judaism, and deny the existence of the Temple in Jerusalem, and contend that the Western Wall is not an authentic remnant of the outer retaining wall of the Temple compound, but rather the western wall of the Al-Aqsa compound, the place that Muslims now identify with Al-Buraq, the Prophet Mohammed's wondrous beast of burden, which according to legend was tethered by the prophet to the wall. I've encountered a lot of this stuff in my own research and have posted much of it on this blog. The article is a good summary of the situation. Read it all. ONLINE PLAGIARIZING is easy to do, but even easier to catch. Horace Jeffery Hodges spells out the details in Gypsy Scholar. This point has not escaped my attention. "Jesus and Yahweh" is not a big book, but it is bursting with ideas and contradictions, discussions (and dismissals) of New Testament scholarship, accounts of Lurianac kabbalah, gnomic Nietzschean utterances and brilliant asides about the essence of American religion. It also contains several outrageous statements - like the insistence that "Torah is Yahweh." Throughout, Bloom writes as if all Western literature were his private Talmud, turning it and turning it to reveal hidden meaning, and taking the whole of it personally: the author of the gospel of John "hates me and I respond in kind."